Some say you can only truly experience the Philippines once you see and partake in traditional festivities that almost every province in the country is proud of. 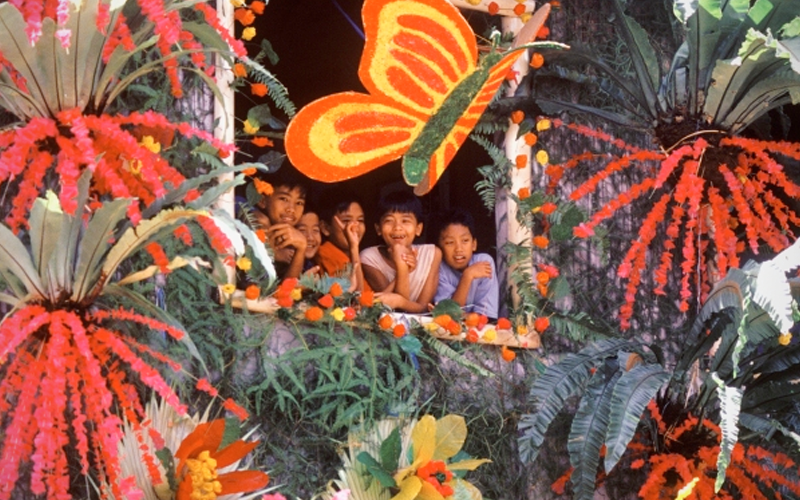 Philippine festivals are perhaps the most effective way to be familiar with the country’s rich and colorful history. As summer draws near more travel itineraries are being planned right now so to help you add an authentic and unique cultural feel to your next getaway, MyProperty comes up with a list of entertaining festivals you can explore. Witness streets come alive with exciting dance and vibrant activities filled with locals and tourists all hyped up to participate in the fun. The tropical country of the Philippines boasts fresh and mouth-watering fruit that are abundantly offered in various provinces; thus, each town celebrate the harvest through fiestas dedicated for the corresponding fruit that a place is known for. For instance, the festivities for the Strawberry Festival of La Trinidad, Benguet, started last March of 2017 and will run until April. Likewise, the world-renowned sweet mangoes of Zambales also have a festival under its name. Held every April in time for the bumper mango harvest, the Mango Festival is surely an exciting feast that attracts mango-lovers as well as tourists who enjoy the exciting tourist spots in Zambales. Both the Strawberry and Mango Festivals feature street parades, float competition, and trade events where you can sample the best products made from these succulent fruit. Celebrated yearly every April in Dagupan City, Pangasinan, is the Bangus (milkfish) Festival meant to honor the bountiful harvest of the province. Pangasinan, the milkfish capital of the Philippines, started a tradition of lighting hundreds of barbeque grills for locals and tourists to sample and savor the delicious bangus. The grills stretch more than a kilometer long, highlighting the importance of the festival to the natives of the province. The grill parade also features a cooking contest, eating competition, dance performances, and street parties. The longest barbeque of culinary experts even earned a spot in the Guinness Book of World Records. The Sarangani Bay Festival, also known as Sarbay Festival, is an annual event that unites both locals and tourists alike in a two-day fun fair. Scheduled every third week of May, this festival celebrated in Sarangani Province is one of the most popular beach events in the Philippines’ southern island of Mindanao. The event caters to all party-goers as it offers a mixture of activities for all. They have extreme outdoor sports for adrenaline junkies or bay parties for fun-seekers. A Filipino festival will never be complete without a gastronomic feast and Sarangani Bay Festival offers one of the best. The fresh produce of Sarangani is surely an exciting reason to visit and taste the best flavors. More than being a lively fiesta, you can also contribute to the community through conservation efforts that happen alongside the festivities, such as mangroves planting. Enjoying pristine beaches while taking care of nature is beyond doubt an excellent way to spend your free time. As a way of thanksgiving to a generous harvest, the Pasalamat Festival is held every First of May or the closest Sunday to the date in La Carlota City in Negros Occidental. The festival highlights a gathering of participants at the base of Mount Kanlaon where cultural traditions to thank the gods of fertility of the mountain are celebrated. Colorful costumes and masks, as well as street music and dances plus delicious local fares, can also be enjoyed in this fiesta. The Pahiyas Festival in Lucban, Quezon, is one of the most popular festivals in the Philippines, thanks to the very colorful and elaborate decorations that adorn the houses of this quiet town every May 15. The decorations, which are known as kiping, are leaf-shaped rice wafers and are arranged in elaborate patterns forming large flowers or colorful chandeliers. Celebrated to honor the patron saint of farmers, San Isidro Labrador, the feast is also the town’s way to thank a great harvest. Pahiyas Festival is also must-attend event especially by food lovers as authentic and delectable dishes are prepared by every household. Hundreds of stalls and merchants of locally produced items, such as the town’s famous longganisang lukban and pansit habhab, are also available for all attendees who are looking for unique souvenirs. Known as one of the most colorful events in the Philippines, Pahiyas Festival is certainly an amazing blend of culture, food, and lifestyle in one exciting affair.